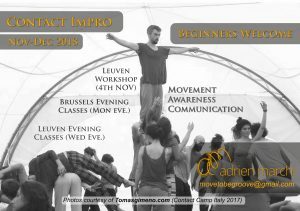 In November & December: Evening classes for beginners in Brussels and Leuven, plus a workshop in Leuven. Description: Beginners Level, welcome to all people without previous experience in CI or dance. A series of 6 classes specially for beginners to understand the basic principles of CI on physical, mental and philosophical level. Possibility to attend the first lesson without commitment for the whole series. For the following lessons, a commitment is kindly asked in order to build a common language and a technical progression in the group. *reduced tarif for early birds, students, unemployed. To benefit from the reduced tarif, you should send me a mail and transfer the total amount before the indicated deadline. hello, I was just wondering if the classes will remain on the same day same time from january onwards? am interested to join! Yes the classes will go on same day, same time, from Monday 21st January on. And you are most welcome to join! 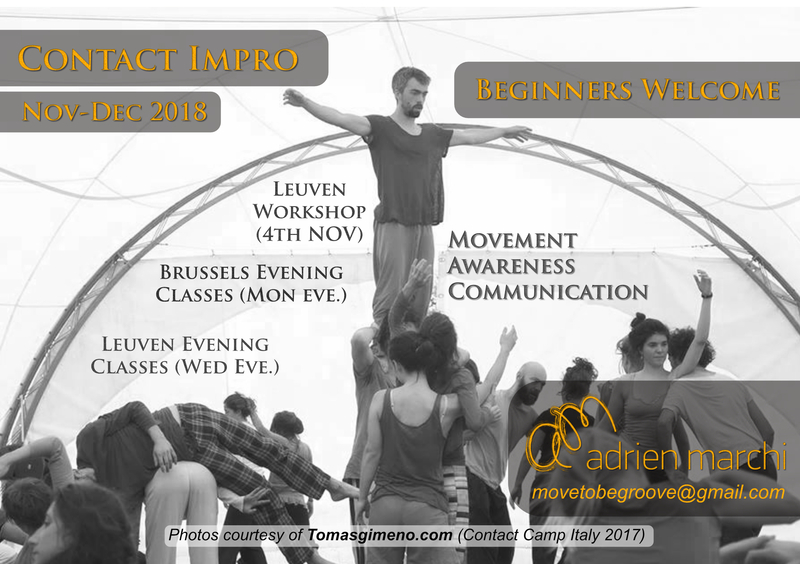 The events will be posted on this website and on the contact impro brussels facebook page today.